Michelle Tillis Lederman, CSP, CPA, PCC, is a speaker, trainer, and author specializing in workplace communications and relationships. She was named one of Forbes Top 25 Networking Experts. 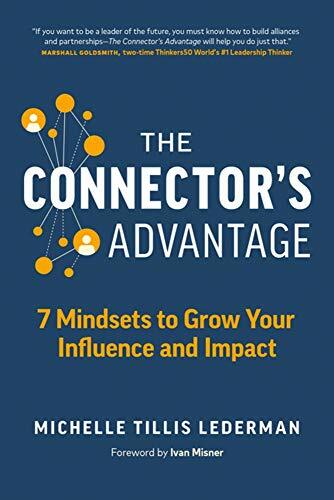 Her new book is The Connector's Advantage: 7 Mindsets to Grow Your Influence and Impact (2019). MICHELLE TILLIS LEDERMAN: "No" doesn't feel so good. We feel a little uncomfortable. We feel bad saying no. "No" to something is "yes" to something else. And that's the first thing you need to think about to give yourself permission to say no. My husband actually put a sticky note on my computer for about a year with the word "no" on it. And it really did give me permission to say no and to remember that that's allowed. So that's the first thing. Then you want to think about how to say no and how to say yes. Because yes and no are never one-word answers. My favorite on the no side is "no, but..." "No, not right now. No, but I could do this instead. No, but this person might be interested." I look to give a no with the opportunity for a yes later. For example, somebody asked me to do a pro bono talk. Happy to do those things if they meet certain criteria. This criteria was driving two hours in rush hour to talk to 30 people. It wasn't going to meet that criteria. And I said, if you can get x number of people in the room, and we can do it during this time of day, then I'm happy to do it. So "No, but here's how you can get a yes" is a great way to enable somebody to feel OK and for you to feel OK and not want to avoid that extended relationship. So when we use a "no, but," we give them an opportunity for a "yes" down the road. But we also can use the "no, but" to help them find another way to get that help. No, but there's this great resource you may want to look into. No, but I do know somebody who's working on that. Let me ask if they might be interested in connecting. No, but. I might not be able to help you. But I'm happy to give you ideas on how you can get the help you're looking for. Sometimes you want to and get to say yes. So we want to sometimes qualify our yes: "Yes, if..." Yes, if you can get this done for me. Or yes, if you can get this many people in the room. Or yes, if. It could be "yes, after." Yes, I'd love to get on the phone with you after I'm done with this big project that I'm working on, or after I get back from vacation. Just giving yourself a little breathing room in when and the timing of when that follow through will actually happen. So we have "yes, if." We have "yes, after." We could have "yes, with." Yes, with your assistance. Or yes, with another party. I'm happy to work on that. Yes, with some training. So "yes, if," "yes, after," "yes, with," or even "yes, when." And when could be, when I feel that I'm really ready to do that. Yes, when I have gotten that training that we talked about. "Yes, when." So all of these things help give you a little bit of space and manage the expectations of the follow through of that yes.